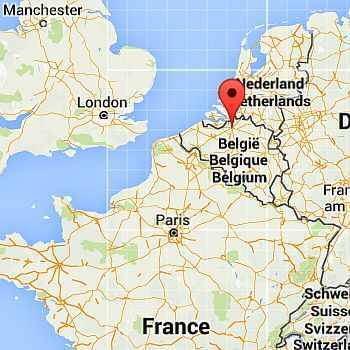 In Antwerp, a city located in the region of Flanders, in the north of Belgium, the climate is sub-oceanic, humid and rainy, influenced by the Atlantic Ocean: winters are cold but not freezing, while summers are quite cool. The average temperature is 3.5 °C (38 °F) in January, and 18.5 °C (65.5 °F) in July. Here are the average temperatures. Precipitation is relatively abundant, about 850 millimeters (33.5 inches) per year, but above all it is common and distributed throughout the year. However, the rainiest seasons are summer and autumn, the least rainy season is spring. Rainfall often occurs in the form of short showers or drizzle. Here is the average precipitation. The wind blows frequently, and can be intense, especially from November to March. Winter, from December to February, is cold: temperatures are on average around freezing (0 °C or 32 °F) at night and a few degrees above during the day; wind and humidity often exacerbate the feeling of cold. However, different weather situations can occur. When the westerlies blow, temperatures can be quite mild, and can reach 10/12 °C (50/54 °F). On the contrary, when the city is affected by cold air masses from Russia, the temperature drops below freezing, for longer or shorter periods, even during the day. The temperature rarely drops below -10 °C (14 °F), however, it can do it in the coldest periods. Here are some values recorded in the coldest winters: January 1979: -14 °C (7 °F); January 1985: -17 °C (1 °F); January 1987: -13 °C (9 °F); December 1996: -12 °C (10 °F); December 2010: -12 °C (10 °F). 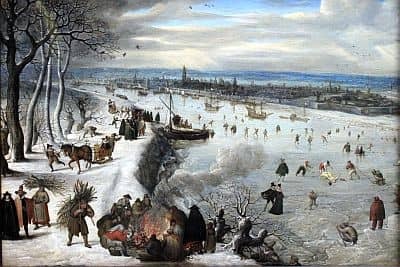 During the "Little Ice Age" (1450-1850), the Scheldt, the river that crosses the city and flows into the sea just north of it, used to freeze quite often; today this happens very rarely. Snowfalls in Antwerp are quite frequent, though usually not abundant, and occur in the form of sleet or light snow, sometimes, however, snow can accumulate on the ground, and last for many days, if it occurs during cold waves. Spring, from March to May, is initially cold, with possible snowfalls still in March, and then gradually becomes milder in April and May, although some cold days, with highs around 10 °C (50 °F), can occur still in May, especially in the first half of the month. However, April and May are, albeit slightly, the least rainy and cloudy months. Typically, in the second half of May the temperatures become permanently acceptable, and there can be the first pleasantly warm days, with highs around 25 °C (77 °F) or even above. Summer, from June to August, is mild, and the flow of Atlantic fronts does not cease even in this season. The wind blows constantly from the sea, and even rainfall is quite frequent. However, there are pleasant periods, when the daytime temperatures are between 20 °C and 25 °C (68 °F and 77 °F), alternating with cooler periods, when they remain below 20 °C (68 °F). At night it can be a bit cold, in fact the temperature can drop below 10 °C (50 °F) even in July and August. Sometimes there can be hot days, with temperatures going up to 28/30 °C (82/86 °F), but this may not occur for a whole month. The highest record is around 35 °C (95 °F), a value reached in August 2003 and 2012, and in July 2015. Autumn, from September to November, is initially pleasant, ie in the first half of September, then it gradually becomes more cold, dull, wet and windy. The first night frosts usually occur in November, but sometimes also in October. 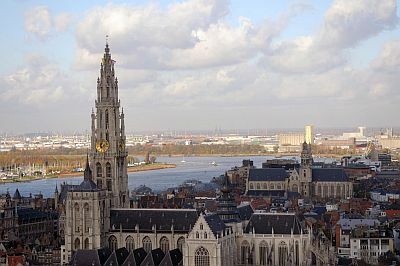 Antwerp does not get a lot of sun, especially from November to February, when the sun rarely shines. It goes a bit better in spring and in summer, when the weather is variable, and between one disturbance and another the sun can come out. There are on average 6.5/7 hours of sunshine per day from May to August. The best time to visit Antwerp runs from mid-May to mid-September, since it is the mildest of the year. July and August are the warmest months. However, it's better to bring a sweatshirt or sweater, a light jacket and an umbrella, for cool and rainy days.